One Eternal Day: "In hoc signo vinces"
As is well known, the previous day Constantine experienced a vision of a cross of light in the sky, with the words “By this sign you shall conquer”.... That night, so we are told, Constantine had a dream wherein he was told to paint the cross on the shields of his soldiers. There are...those who take Constantine’s conversion as the beginning of the end of real Christianity. Christianity, they argue, is the Christianity of the early Church, the Church before it became favored and hence entangled with the empire, the pure Church, the Church before Constantine, the Church of the martyrs. 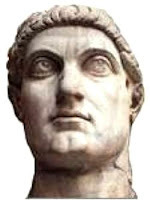 With Constantine’s favor, the Church began to blossom, and was free to spread out all over the Western, and then Eastern, parts of the Empire, thereby shifting its civilization from pagan to Christian moorings. This was no small shift—it entailed a vast moral and political transformation that laid the foundation and built the structure of Christian civilization. ...Constantine did not actually, officially, really become a Christian until very near his dying day. Like so many of the time, he held off on being baptized until the threshold of his departure. Feeling the approach of death, he very piously laid aside the royal purple, took upon himself the humble white robes of the to-be-newborn Christian, and entered the waters of regeneration. Such is the danger of royal patronage: the Church, and even its doctrine, can be defined by the state. This truly was a political conversion and open the doors as the writer suggests for the "Church" to blossom. He who lives by the sword will die bu]y the sword. It took until the Radical Ieformation of Separatists, Independents and Baptists to once again establish a "free churches". It took Constantine until his death bed to be Baptized a Christian. This compromise allowed the State to call councils to make theological decisions for the Christian Community. While the God who is always present works in interactive dialogue with the decisions made by humankind perhaps the Christian Community had other options that not just maintained purity but also would have allowed it to have thrived in the manner set forth by its NT faith. I believe the Father , Son and Spirit used the events of Constantine but these events came with compromise and the "Church" taking on a Statist sSystem of its own.